Dies R Us: Some Bunny Loves You! Once again, Wednesday has rolled around & it's time for my turn to share a bit of inspiration. I know it may be a bit early to begin on Easter cards, but if you have been to the Dies R Us store lately, you know how many absolutely incredible dies they are carrying. And not just for Easter, either!! 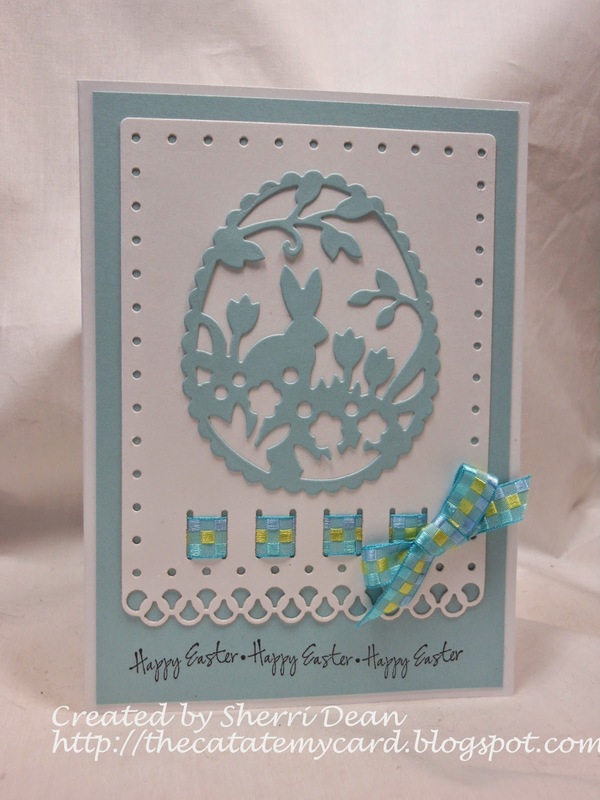 My Easter card for today uses only two dies & goes together so quickly you will be amazed. The two dies are Die-Namites Spring Egg Scene & Spellbinders A-2 Fancy Ribbon Threader. I love the look of this beautiful "egg" matted with the Spellbinder die. You can change the look of this card entirely by switching to other colors or using contrasting ribbon. If you have no ribbon to match, you can just as easily cut a narrow band of your paper & thread THAT through the slits! That's a trick I have used many times. Don't forget to check out the rest of our great design team posts this week too! Our gals have so many wonderful ideas that you are sure to find something that inspires you! And remember, the Dies R Us Challenge Blog just began a new challenge on the first! Enjoy the rest of your week & create something fantastic!